A celebration of the brewer's art featuring world class beers and brewmasters from around the region, country and world, showcasing rare and exotic specialties. Visit brewvival.com for additional information. All MORNING shuttles will pick up at the Visitor Center - 375 Meeting St. Charleston, SC 29403 and drop off at COAST Brewing. 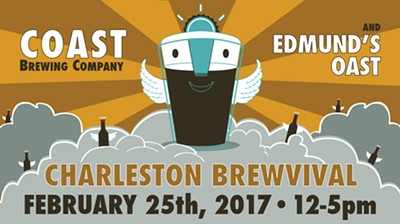 All AFTERNOON shuttles will pick up at COAST Brewing and drop off at the Visitor Center - 375 Meeting St., Charleston, SC 29403. The field across from COAST Brewing Co.